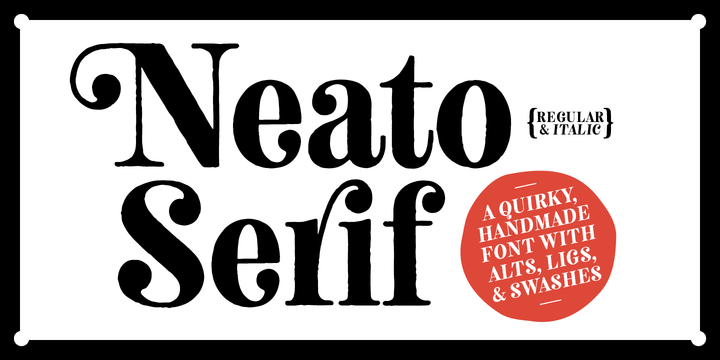 Neato Serif font is a hand drawn typeface created & published by Adam Laad which is available in 2 styles, over 500 glyphs per each font, useful OpenType features and language support. To access all alternates, ligatures and swashes use PUA-ancoded and his wide range of programs. It is ideal for typographic use, branding, book, display, headline, magazine, etc. Have fun! Price: both font for only $23,00. A font description published on Monday, January 22nd, 2018 in Adam Ladd, Fonts by Alexandra that has 5,826 views.